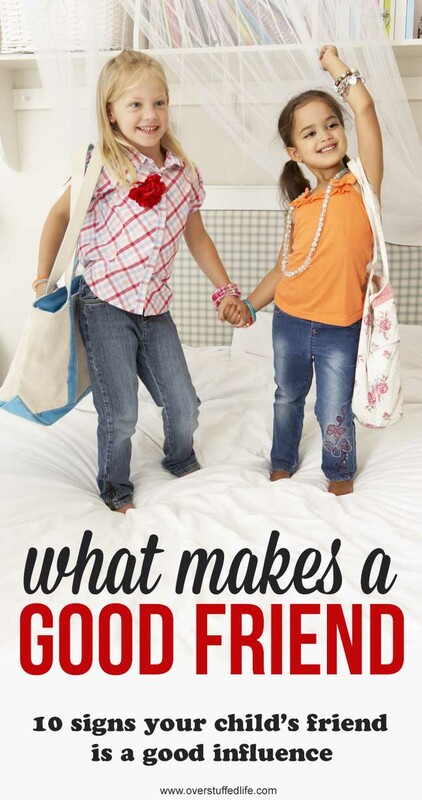 After my daughter Chloe went through a particularly difficult friendship with a girl who turned out to be a bully, I've thought a lot about what makes a good friend for my children. I am so thankful for the friends who have been good influences in my children's lives. I'm not just grateful for the friendship, I'm grateful for the examples they have set and the way they help my daughters to be their best selves. 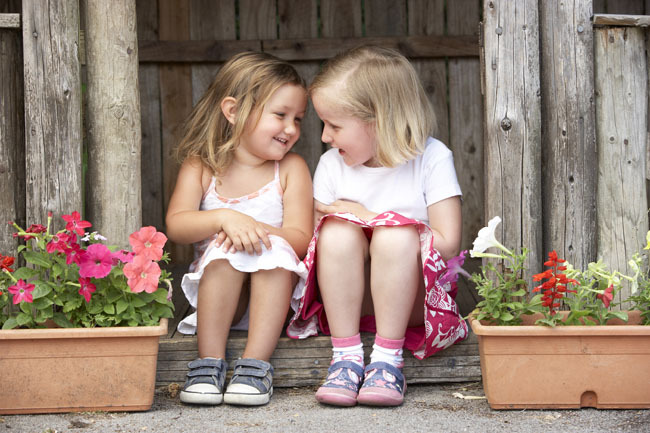 I've found that the signs that your child has a good friend are often the exact opposite of the signs that a friend might be a bully or a person who ends up bringing your child down. The other day while Chloe had a friend over, I was noticing what a great friend she was. I've always known it, but that day I found myself overwhelmed with gratitude for that friend. They were just sitting on the recliner in our living room reading Harry Potter—one of them in Book 3 and the other in Book 4. They didn't even need to be talking, they were just happy to be together sharing something that they loved. There's nothing better to a parent than a good friend for their kid! 1. They are respectful to adults—including you. One of the first things I noticed with Chloe's bully friend was that she refused to spend time in our home, and wouldn't even look me in the eye, much less talk to me with respect. It was pretty disconcerting as a parent! The good friends my daughters have all talk to me respectfully and are happy to spend time in our home. 2. They don't expect an exclusive friendship. Good friends recognize that you can have more than one friend. They do not constantly ask "who is your best friend" and make their friends feel like they have to choose between them and other people. They are able to have fun with your child in a large group of friends (like at a birthday party) or one-on-one, and they don't get jealous if your child spends time with another friend sometimes. 3. They help influence your child to make better choices. As a parent, this one is huge to me. It's a truly good friend who helps influence your child for good! I love it when friends of my strong-willed, often pushy, daughter Sophia help her to realize she's pushing me too far. I love it when my girls have friends who encourage them to study and do well in school. I love it when their friends choose uplifting movies to watch together. Peer pressure is awesome when it is helping your child to make good choices that will serve her well in the future! 4. They speak kindly of others. There is so much ugly gossip that goes around—especially with girls, I've noticed. While I have tried to teach my own daughters to always be kind, I appreciate it when that value is validated by their friends. I notice when the girls my daughters hang out with speak kindly of others and change the subject or stand up for someone if mean gossip begins, and I appreciate it. 5. They treat your child with respect and kindness. The same kindness they exhibit towards others, is also given to your child. There are no cruel jokes. No making fun of your child. A good friend builds up and doesn't tear down. Nobody is perfect—not even the best of good friends! And my children certainly aren't perfect. A good friend understands this and forgives when their friends mess up. 7. They stand up for your child when necessary. A good friend will always have your child's back. If other kids speak unkindly about her, she will set them straight! 8. Your child is happy after spending time with them. It's my favorite thing to see my kids happy. Chloe was just so darn unhappy when she was hanging out with her bully friend and it hurt my heart to see her like that. When my kids come home from spending time with a friend and they are happy and excited to tell me all about it, I am thankful to that friend for being so great! A good friend understands the give and take of conversation. They don't make every conversation all about themselves and they listen when your child has something to say. 10. They love your child. Most important of all, they truly love your child. I am so thankful for the wonderful friends that my daughters have because I know that they love my kids. And my kids love them. And guess what? I love them, too.